As a historical introduction, it is noted that the DeGonda family roots are deeply set in the easternmost Swiss canton of Graubünden, or Grisons. The family spoke the Romansch language, which is used by only one percent of the Swiss population. This tongue derived from ancient Latin and evolved in its own environment, due to the area’s isolation. Switzerland was not a united nation until the 19th century. Various leagues and coalitions shifted alliances back and forth, as did the religious struggles following the Reformation. Switzerland's cantons raised revenue by renting their armies as mercenaries to the great powers of Europe. A large loss of life on foreign battlefields was the result as nations slaughtered the mercenaries rather than native troops. People emigrate from Switzerland today . . . neither for religious or political reasons, those two great and powerful causes of the emigrations of other centuries; an emigrant leaves the fatherland today in disgust because he cannot own there enough soil to live reasonably well, or at least in order not to die of hunger, and to live after some fashion. The April 1815 volcanic eruption of Tambora in Sumbawa, Dutch East Indies, exacerbated the cool wet weather of the Little Ice Age by ejecting 220 million metric tons of fine ash into the atmosphere and drastically reducing solar radiation reaching the earth. Heavy snows and flooding in 1816 ruined the harvest and increased bread prices eight-fold. This was followed by famine and shadowed by disease. High tariffs and the Napoleonic blockades had damaged industry. These problems thrust an increasingly larger portion of the population below the poverty level, and local emigration boards responded by paying some of the poorer families for their communal rights in pasture and woodland, which enabled them to leave. Between 1850 and 1910 the Tujetsch sent 240 persons to America through this approach. This practice peaked in the 1870's but eventually caused international protest from the receiving nations as invalids, sick, aged, and criminals were also dispatched. Others thought that emigration was also due to illness, particularly the "falling sickness," a term for epilepsy at the time. Politically, some cantons began rebelling in 1831-1832 in order to incite reform. In December 1845 a separate federation of the seven Catholic cantons formed, called the Sonderbund. Federal troops dissolved it by force at the cost of 128 killed and 435 wounded. At approximately the same time, 15,000 militant Italian refugees fled to Grisons. When the province failed to remove them, the federal government did so. Augustin Maissen's research on the Romansch in America states that the main source of the emigration was Sursilva [the region "above the forest"] of the Rhine Valley, particularly from the regions of Ladi, Lumnezia, and Foppa, along with Schons [Schams?]. A smaller contribution came from Surmir, Tumliasca, and Trin [Trun?]. To the east, the Engadines preferred Italy rather than America. Maissen comments on a small emigration of Grisons in the 18th century to Pennsylvania, Carolina, and Georgia. He estimates 30,000 emigrated between the years 1820 and 1910. He basically lists the same reasons for the move as pointed out above, mainly the economic crisis brought on by local civil wars, an end to foreign aid, several winters of starvation, and no industry. He quotes the proverb, “Ubi bene ibi patria [Where it’s good, there is the fatherland]." In summary, any of these reasons may have helped influence our ancestors to emigrate. Agricultural problems are very likely, though for many of the early emigrants, restlessness and an urge to roll the dice and gamble for an American farm and fortune may have been cause enough. Maissen names four major foci of the Romansch immigration to America: Wapakoneta, Ohio; Stillwater, Minnesota; St. Henry, Minnesota; and the Colonia Ligia Grischa at Lake Badus and Ramona, South Dakota (founded in 1878 by a group from Stillwater). Smaller Grison colonies are found north of St. Paul at Tell; in Dubuque, Iowa; and in California at San Francisco, Modesta, Kern, Eureka, and the San Joaquin Valley. Emigration from Graubünden to St. Henry, Minnesota, centered on a handful of Romansch-Swiss families including: Allick, Beer, Genelin, Jaeger, Muggli, Schwartz, Simonett, Tambornino, and Vance. The year of arrival is given as 1852 in some sources. 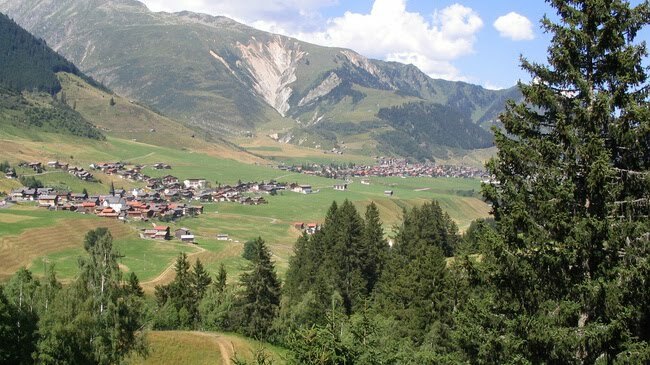 Century of Memories states that one group of 147 people, including brothers Jacob Franz and Martin Ludivic Tambornino, and Jacob Freiberg, left Graubünden in 1854 (the so-called "year of the lots") for America. They traveled by wagon from Trun to Schaffhausen in northernmost Switzerland, followed by train to Paris and then to LeHavre where they boarded the French ship St. PauI. The departure date is given as 7 April 1854; they reached New York City on 8 June 1854. After a quarantine period on Long Island, they crossed the Erie Canal and wintered in Toledo, Ohio, where cholera struck. Most continued on in the spring of 1855 to Stillwater, Minnesota, but trouble in the lumber industry there pushed many farther west--some to St. Paul, while others eventually settled in the St. Henry area in Le Sueur County. Another portion of this group went south from Toledo to Wapakoneta, Ohio, and to the nearby Romansch monastery of Mariastein. By 1866, when the DeGondas emigrated, these settlements were already in place and offered some support as many family members and friends were already in America. The "Degonda" or "DeGonda" name is relatively uncommon, with only 30 entries found in United States’ telephone books. The Social Security Death Index lists only 13 "Degonda/DeGonda" names. The community of Tujetsch has 9 villages: Tschanut, Selva, Rueras, Gonda, . . . Sedrun, Bugnei on the left side of the river . . . . In the year 1768 the people was counted the first time by an Antony De Gonda. There were then 800-1000 persons living here. Baedecker's Switzerland, 1913 edition, mentions a Hotel-Pension Degonda of 40 beds at Compadials near Disentis. 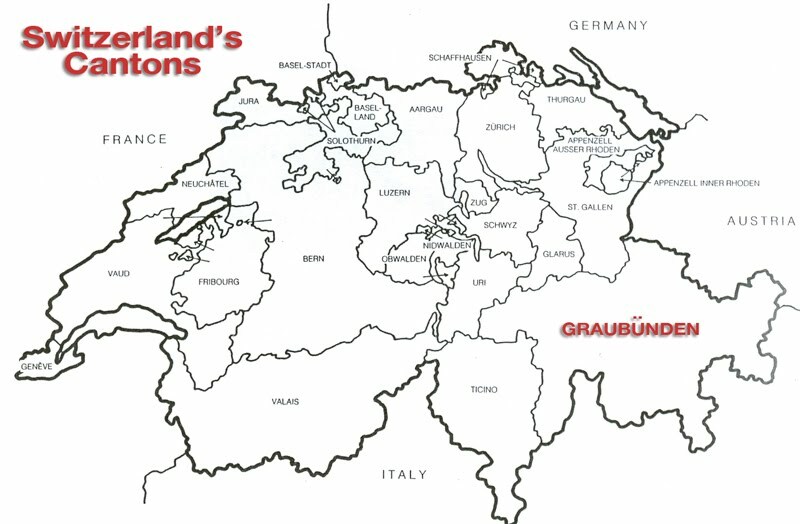 Currently (1999) an Ernest Degonda of Iianz serves as a representative for the Fünf Dörfer [literally "five villages"] district on the kantonsparlament of Graubunden. Lucia Degonda is a photographer from the Universiry of Zürich. A Swiss architectural firm is known as the Familie Degonda.